We will no longer sell auto parts after March 15th. 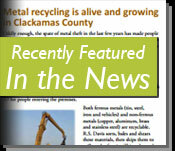 Our sister yard is now open for scrap metal recycling and auto part in Longview, WA. PNW Metal Recycling is open Monday-Friday from 7:00am - 4:00pm and is located in the Mint Farm Industrial Park at 3500 Hoehne Avenue. Call (360)-353-3939 to find out more or click here for directions. Recycling metal is more than just earth friendly–it can be very profitable, too. R.S. Davis Recycling specializes in scrap metal recycling, serving businesses and homeowners throughout Oregon and Washington from three convenient locations: two in the Portland metro and a third in Hermiston, Oregon. We buy steel, aluminum, copper, stainless, brass, tin and more. With over 40 years in the business, we've earned a reputation for honesty and integrity. By using the most efficient technologies and sustainable practices in our industry, we can offer Oregon and Washington residents better service and better value for their scrap metal. Let us show you how easy it is to recycle your scrap metal into cash! Stay tuned for the date of our next drawing!